Take a cooking class at ChefShop.com® during the month of August, and celebrate some of the most loved food movies of all time. ChefShop.com announces four new cooking classes based on four culinary cinema classics: Julie & Julia, Big Night, My Big Fat Greek Wedding, and 100-Foot Journey. Viewing of movie before class is not a requirement but is highly recommended, and not just because all of the selected movies are well worth seeing, but because it's all part of the fun and experience of learning to cook your favorite movies at ChefShop.com. Every Wednesday and Thursday evening for the last 5 years, ChefShop.com has been teaching people how to cook. At the same time, they have been educating people about the importance of selecting the right ingredients, why quality is so important to putting good food on your table, and the secret to selecting ingredients that pack a flavorful and healthy punch - one of the secrets to fine dinning that every high-end chef knows. 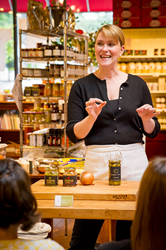 All of the Cooking Classes at ChefShop.com are held in their Seattle retail store (1425 Elliott Ave West, Seattle, WA, 98119). All classes include appetizers and wine before class, and of course, many food-related stories and the opportunity to socialize with other local and visiting foodies and home cooks. Classes are presentation –style and appropriate for all skill levels – from cooking novices to advanced home chefs. Recipe packet are included with the class so that you can easily recreate the recipes again at home. The fee for the class is $79 and includes a light meal at the end of the evening and a 10% discount on all store purchases. Viewing of movie not included. ChefShop.com is your online and brick-and-mortar retailer for premium foods and ingredients, grown and made by family producers, all individually selected for quality, adherence to tradition, purity, provenance, and most importantly, flavor. It’s mouth-watering food born from passion and commitment. ChefShop.com: eat simply! live well!